Advent is not a particularly easy time for me. In fact that’s a bit of an understatement. I cannot stand this time of year; the build up to Christmas. People often laugh at me for my distain toward the season and call me Scrooge. But you see, for me this time of year holds nothing but painful memories. I did not come from a happy home, and the tension which has come to envelop the season of advent was crippling in my household. The stress got to everyone; my mother spent a large amount of time in tears, whereas my father would simply deal with it the way he dealt with everything - using violence, which was generally aimed towards my brother or I. As I got older and hit my teens, the resentment kicked in, and I rebelled against any manifestation of anything Christmassy and refused to take any part in what I could only understand to be a completely hypocritical holiday. Was the birth of Christ not supposed to be a light for the entire world? Wasn’t Jesus supposed to be our saviour? I remember how I used to remark, bitterly: 'I wish the baby Jesus had never been born'. Back in 2002, The Samaritans brought out a poster campaign using those exact words. And in fact it’s terrifying to think how many people this advent will buckle under the pressure that this season brings with it. Present buying, credit-crunch, family feuds, tacky decorations, it’s unsurprising really that there are so many out there who, like me, dread the festivities. It makes me wonder what it is that this ‘Christmas’ thing is really all about. Here we are in a largely non Christian society, and this is the one time of year that everyone comes together to celebrate a Christian festival. But Jesus is generally kept at a distance throughout the holiday. And not just by the secular society. As Christians we’re really good at giving the right impression, showing everyone that we’ve got it sorted; the Jesus thing. But actually, how far do we let Jesus into our lives at Christmas? Where is he in our list of priorities; our very long list of things we need to do for the big day; the gift buying, the wrapping, the food shopping, the cooking, christmas cards, parties, kids shows, circling the best programmes in the radio times and... who's birthday is it again? The list goes on. How much does Jesus encroach into our carefully timetabled routine for Christmas? 'There he is,' I hear you all cry 'there in the manger!'. Is that where we keep him? 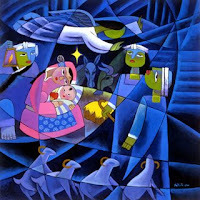 If we take the nativity scene, the image of Jesus as a baby is a nice, easy one. As a baby, he is cute but still out of the way, he is there, but he doesn’t have to have too big an impact on our lives. The thing is, the baby grew up. And so must our faith. Its easy for us to keep Jesus in church; it’s neat and tidy, and surely that’s where he belongs? It’s safe for us if that’s where Jesus stays; we can encounter him on our own terms, in our own time, surrounded by our family and friends. Because it’s actually quite uncomfortable for us this comfortable Christmas time to see Christ in the eyes of those who are suffering, those who are lonely, homeless, marginalised, unwanted. If we keep Jesus in church, in the manger, in the nativity scene, we don’t have to hear the challenges that he brings this season – challenges of forgiveness, acceptance, justice, peace. So as I try to recapture some of the magic that is supposed to be part and parcel of this holiday, I cannot forget what Christmas really means. Immanuel. God is with us. At Christmas, God came to earth as human. He identified with us. He suffered as we suffer; he knows the pain of human existence. Christ came to live an ordinary life, he became human so that he could hold our hand. God is yearning for us to let him in, to let him heal our pain and touch our hearts, even when it’s hard or uncomfortable. And we are yearning for God to do this – He is our reason for existence. When the angel Gabriel appeared to Mary one night more than two thousand years ago and told her what she was called to do, she answered “I am the Lord’s servant. May it be to me according to your word”. She did as she was called to do. She was just an ordinary girl, living an ordinary life, but God called her. She is not alone. We are just ordinary people, living our ordinary lives, but God calls us to serve him. Ultimately, we are a people called for a specific purpose, we have a great commission, and in this season we are reminded of the message that we are supposed to be spreading; a message of joy, hope, love and peace. I’m not saying that there isn’t a place for gifts, or food, or good TV, or (dare I say it) even the Christmas tree, but having spent the past three weeks reconciling myself with this festive time of year, I pray that we will not lose sight of what this is all about. I am not the first blogger to use John the Baptist’s words, but I feel they must be reiterated; “Prepare the way of the Lord, make his paths straight.” As advent people we are preparing for the second coming of our saviour. And that won’t always feel easy, or comfortable, or safe, but that is what we are called to do. "Steadfastness in a spasmodic era". where are you in advent?